NewsgroupDirect's pricing is very simple. They offer high speed and unlimited downloads across their plans. You will also be able to use free headers, header compression and a 7day with 15 GB money back guarantee. Another thing to note is that their plans offer free SSL encryption. 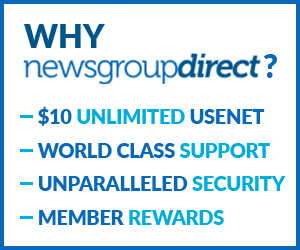 Unlimited Monthly $7.95 Plan: NewsgroupDirect's currently offering their High-Speed Plus access to new customers for $7.95 a month. This plans offers unlimited downloads, 50 Connections, SSL Encryption and Ghost Path VPN Access. Unlimited 6 Months $40 Plan: This plan comes with High-Speed Plus access to new or current customers for $40 a month including unlimited downloads, 50 Connections, SSL Encryption and Ghost Path VPN Access. Unlimited Yearly $75: This plan is for customers that are interested in the annual plan. It comes with High-Speed Plus access to new and current customers for $75 a year which works out to only $10 a month. Unlimited downloads, 50 Connections, SSL Encryption and Ghost Path VPN Access are also included in this plan. Their payment i methods includes Visa, MasterCard, American Express, Discover, Worldpay and Paypal payments. NewsgroupsDirect offers free trials to every customer that pays with credit card issued in the USA. You receive a 7 day, 15 GB money back guarantee. NewsgroupsDirect offers Newsleecher for window users and Uniso for mac users. The newsreaders gives you the flexibility to search for news or post from groups you are currently following. This post can as well be downloaded and used later. NewsgroupsDirect has an improved Global search feature that enables usenet clients to be able to search the entire retention range for content on the usenet network. If you are somebody that likes to surf the internet anonymously, it’s good to note that NGD offers VPN services to its customers through their Ghost Path VPN service. When you connect through their Ghost Path VPn Service, your traffic goes through their VPN services which mask your IP address and hide your data from unwelcomed guest. So, from whatever location you are, either you are connected to hotspot or Wi-Fi, their Ghost Path VPN service can help you a whole lot. NewsgroupDirect's has three servers installed in the United States (Virginia), Europe (Amsterdam, NL) and Frankfurt, DE. NewsgroupDirect's uses a speed-optimized UseNet Server to bring Hi-Speed to its customers. Even if you constantly decide to max out on your connections, you will be impressed at the uncapped speed available through them. NewsgroupDirect's offers a 24/7 customer support via email, chat and phone. They simply have some of the best technical support in the industry, so, you can expect fast, knowledgeable and detailed response to questions. When it comes to the best UseNet provider, NewsgroupDirect's is a frontier in this industry simply because they have been around for a long time. Their pricing, retention and speed makes their services the best UseNet provider around the world. Their reliability and UNS global search feature places them ahead of every other Usenet provider in the Industry. For the high-quality and efficient service the offer, we recommend to everyone who enjoys the likes UseNet. Start Newsgroup Direct Free Trial!